Bryan Holaday – C – TCU. 1-2. BB. 6th round pick (Detroit). Matt Curry – 1B – TCU. 0-3. 16th round pick (Pittsburgh). Taylor Jungmann – RHP – TEX. 8.1IP 6H 1ER 2BB 9K. (W, 8-3). Dominate performance for the likely top 10 2011 pick. Cameron Rupp – C – TEX. 1-5. R. Phillies 3rd round pick. Connor Rowe – CF – TEX. 0-2. Washington draftee (21st Round). Russ Moldenhauer – DH – TEX. 0-4. K, R. Nationals draftee (24th Round). Aaron Westlake – 1B – VAN. 1-4. RBI,K. Drafted by Toronto (22nd). Andrew Giobbi – C – VAN. 0-3. RBI. Drafted by Seattle (32nd). Jason Esposito – 3B – VAN. 1-2. 2R, 2BB, HR(12). Sophomore should go in early rounds in 2011. Sonny Gray – RHP – VAN. 6IP 7H 2ER 3BB 3K. (W, 10-5). Sophomore should be a 1st round pick in 2011. Tyler Holt – CF – FSU. 1-5. K. Indians 10th Round pick. Stephen Cardullo – SS – FSU. 2-4. Drafted by Arizona (24th). Geoff Parker – RHP – FSU. 2.1IP 5H 4ER 0BB 3K. Drafted by Colorado (9th). Yasmani Grandal – C – MIA. 0-4 The 12th overall pick (Reds). Stephen Perez – SS – MIA. 0-2. K. 2012 draft prospect..
Scott Lawson – 1B – MIA. 2-4. Drafted as a 2B in the 29th Round Pick (Rays). Chris Hernandez – LHP – MIA. 8.1IP 3H 1ER 3BB 4K. Boston’s 7th round pick did everything he could do to keep the Canes alive. Austin Maddox – 3B – FLA. 1-5. RBI. 2012 Draft Prospect. Christian Colon – SS – CSF. 1-3. R, 2BB.. The 4th overall pick (Royals). Corey Jones – 2B – CSF. 1-2. 2RBI. Went in the 7th round (Tigers). Carlos Lopez – DH – CSF. 0-4. BB, RBI, 2K. Selected in the 37th round by Detroit. Nick Ramirez – 1B – CSF. 0-5. 2011 Draft prospect. 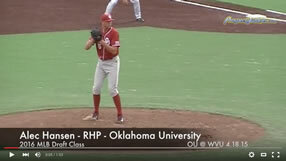 Daniel Renken – RHP – CSF. 4.1IP 2H 2ER 2BB 6K. Drafted by Cincinnati (25th). Trevor Bauer – RHP – UCLA. 7IP 9H 6ER 2BB 6K. Sophomore is 2011 Draft Prospect. Niko Gallego – SS – UCLA. 0-3. R, BB, K. Drafted as a 2B in the 27th round (Arizona). Oklahoma 2 Virginia 3 (Virginia Leads Series 1-0). Daniel Black – 2B – OK. 1-4. 2K. Drafted by FLA (14th). Garrett Buechele – 3B – OK. 0-4. 2K. Drafted by Texas (18th). Kevin Arico – RHP – UVA. 1IP 1H 0ER 1BB 2K. (S, 18). One of the most effective closers in the nation. Drafted by Cincinnati (10th). Jarrett Parker – CF – UVA. 1-4. 2K. Drafted by San Francisco (2nd). Tyler Cannon – SS – UVA. 0-3. K. Drafted as a 3B by Cleveland (12th). Jimmy Nelson – RHP – ALA. 6.2IP 9H 4ER 5BB 4K. (W, 9-3) Drafted by Milwaukee (2nd). Josh Rutledge – SS – ALA. Colorado – 3rd. 0-3. R, 2K. Ross Wilson – 2B – ALA. 0-4. 2K. Drafted by the White Sox (10th). Jake Smith – 3B/RHP – ALA. 2-4 RBI, R, K, HR (12). 2IP 1H 0BB 2K. (S, 6). Drafted as a 3B by Philadelphia (15th). Hitting a HR and getting a save. Classic Collage Baseball. Clay Jones – 1B – ALA. 0-3. 2K, R. Drafted by Detroit (32nd). Kyle Parker – OF – CLE. 1-4. BB, K. Drafted by Colorado (1st). Michael Freeman – SS – CLE. 2-5. K, RBI, R. Drafted as a SS by Arizona (11th). John Hinson – 3B – CLE. 0-3. BB, K. Drafted by Philadelphia (13th). Jeff Schaus – OF – CLE. 3-4. RBI, K. Drafted by Cleveland (27th). Casey Harman – LHP – CLE. 8.1IP 10H 1ER 0BB 9K. (L, 7-3). 4 unearned runs doomed Clemson. Drafted by the Cubs (29th). John Nester – C – CLE. 0-1. Drafted by Oakland (39th). Whit Merrfield – RF – SC. 1-5. R. Kansas City (9th). Blake Cooper – RHP – SC. 7IP 6H 3ER 3BB 5K. (W, 12-1). Arizona (12th). Bobby Haney – SS – SC. 1-3. R, 2K. San Francisco (22nd). Rico Noel – OF – CC. 2-5. 2K. Drafted by San Diego (5th). Scott Woodward – 3B – CC. 0-4. 2K. Oakland – 15th. Austin Fleet – RHP – CC. .2IP 1H 0ER 0BB 0K. San Francisco (16th). Chance Gilmore – OF – CC. 2-4. RBI, K. Dodgers (25th). Keith Hessler – LHP – CC. 1.1IP 1H 0ER 0BB 1K. Arizona (28th). Zack Cox – 3B – ARK. 2-5. R, K. St. Louis 1st Rounder limited to DH duty because of Back injury. Brett Eibner – CF/RHP – ARK. 1-5. 2R, RBI, K, 2B : 2.2IP 1H 1ER 1BB 2K (L, 3-5). Drafted by Kansas City (2nd) as a pitcher. Andy Wilkins – 3B – ARK. 2-5. R, K. White Sox 5th round pick was selected as a 1B. Mike Bolsinger – RHP – ARK. 3IP 3H 3ER 5BB 4K. Arizona – 15th. Collin Kuhn – LF/CF – ARK. 1-6. K. Detroit – 15th. Jordan Pratt – RHP – ARK. 2IP 4H 1ER 3BB 2K. Florida – 22nd. Seth Blair – RHP – ASU. 5IP 9H 5ER 2BB 6K. Drafted by St. Louis (1s). Kole Calhoun – OF – ASU. 1-2. 5BB, 3R, K, RBI, HR (17). What a game for the Angles 8th round pick. Drew Maggi – SS – ASU. 1-6. BB. Pittsburgh – 15th. Raoul Torrez – 2B – ASU. 1-6. RBI. Arizona – 21st. Deven Marrero – DH – ASU. 2-7. 3RBI. Freshman will step into every day SS role next year.